KEY FEATURES: To 40cm. Oval. 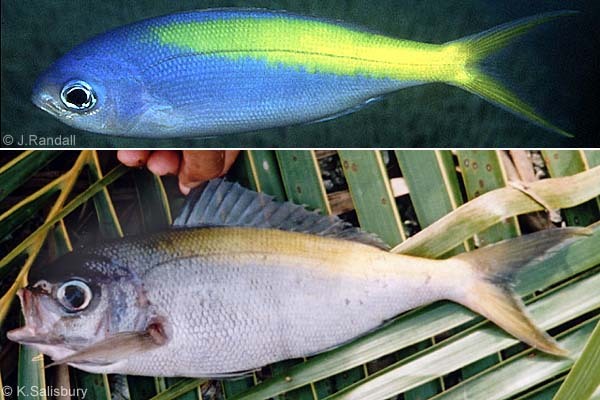 Dark blue above, pale blue below with broad yellow stripe on upper body starting below Dorsal Fin origin & covering tail-base & tail; all other fins blue. GENERAL NOTE: Mid-water planktivore, schooling. Pukapuka: fieldspecimen+photo, 3/2004, K.Salisbury with ID as Paracaesio xanthurus by G.McCormack, 12/2004.